In this interview with Professor Jerry Muller, author of The Tyranny of Metrics, one of the things we discuss is how metric fixation kills KPI buy-in. The following is one of my favourite parts of the discussion I had with Professor Jerry Muller, about the ideas in his book, The Tyranny of Metrics. The full interview recording is linked at the bottom of this excerpt. That’s got me thinking a little bit, Jerry, about this feeling of how measures can evoke in people either a feeling of defensiveness from the fear of them being used against them, or evoke in them a feeling of ownership and curiosity that can drive them to learn and improve things. Yes. I agree. Almost everyone in any field will find that if there are measures, that there are tests, there are measures of performance that are going to be useful. They have to feel that they’ve played a role in developing those. Not because they’ve been propagandized into it but because they actually have played a role in developing it. Often, the kind of exchange of information between colleagues that takes place in developing the measures of performance can itself be the most valuable part of the process. Especially because used properly, I think measures of performance are not a kind of one-shot deal where you develop the measures and then you’re going to use those measures continuously in the same form, iteration after iteration. It may very well be that as of because of the experience of using them, you see that the measures need to be changed or fine tuned. Either because you see that there were problems with the measurement to begin with or because people have begun to deem the metric, or because your organisation has changed. If measurement is a kind of weigh station through which colleagues use their expertise and experience to figure out what to measure, and then use their expertise and experience to figure out how much weight to give to the things that they have measured compared to things that they perhaps haven’t been able to measure or perhaps that can’t be measured, then use their expertise and experience to collaborate to evaluate how useful those measures have been and how they might be altered or improved in all those ways when you combine judgment based on experience and expertise with measures, then you have a very potentially profitable formula. Beautifully said. That’s buy-in, or engagement or ownership. In this field of performance measurement it’s something that’s constantly overlooked. You’ve just described it beautifully: what it looks, sounds, and feels like. I just want to return to that word buy-in because I notice it’s actually used in two different ways. One is the way in which I think you and I would use it. That is buy-in because practitioners identify with the measures because they’ve played a role in developing and evaluating them. Versus the notion of buy-in as we outsiders and management are going to figure out some measures and then we’re going to propagandize the people below us so that they will purportedly buy-in. It’s sometimes used in that sense. I think that’s a distortion. They’re different meanings for sure. The second way you described buy-in, I call that sign off. We’re trying to get people to sign off on this and just help us move on. That’s a rabbit hole, that one. Jerry, when metrics or performance measures of any kind really are used to judge, to compare, to reward and punish people or teams, you talk a lot about what the consequences are. What are they? I guess what I’m asking about here are the negative consequences of that and largely the reason why you even chose that word tyranny in the first place. A lot of my book is about the negative consequences. I use the term ‘tyranny’ because when metrics are misused in the way they are in what I call metric fixation, it can lead to a sense of demoralization. Where are measures or metrics or KPIs used in your organisation to judge, to compare, to reward and punish people or teams? How’s the buy-in? Is it time for a change, to use measurement for learning rather than judging? Learning rather than judging?. Doesn’t measurement involve judging or comparing? How do we ascertain if the targets have been achieved. 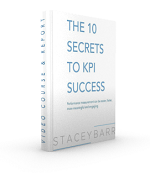 KPI measurement is designed for performance management. Without it, there is no baseline to ascertain progress and in it’s absence employee rewards are based on biased and arbitrary opinions. The problem arises, when people don’t know how to leverage the measurement benchmarks for positive outcomes. The misuse and abuse hijacks the purpose and values of measurement, leading to the myopic and narrow fixation. Most managers stop with lag measures for judging and fail to explore the improvement part.That’s why Data Analytics/Reporting and Performance Appraisal are ineffective tools for progress/improvement/change. For 4 years, I tried to sell the top leadership to move beyond the traditional lag measurement fixation, but failed. Yuvarajah, the point is not to use measures to judge or compare people. We want to do what you suggest, which is use measures to evaluate our progress to targets that matter. Originally, KPI measurement was designed for monitoring strategic goals and organisational performance, not people. But somehow it was taken on by many HR professionals and the meaning of the term KPI changed for them, in that context. It’s become very confusing!